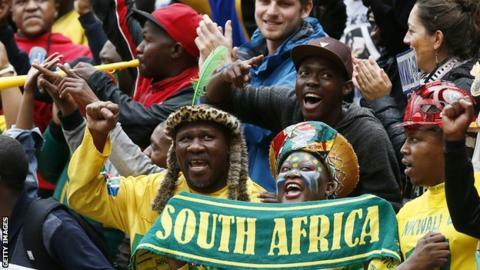 South Africa made the Friday night deadline and submitted a bid to be replacement hosts for next June’s Africa Cup of Nations finals but the South Africa Football Association (SAFA) says it is seeking clarity on the price tag of the tournament. The Confederation of African Football (Caf) confirmed that South Africa and Egypt are the only two countries in line to take over the hosting of the tournament from 15 June – 13 July 2019 after Caf stripped Cameroon of the right to hold the tournament. Egypt had already expressed their interest to host Africa’s showpiece tournament last week. “We submitted our intention to host and our bidding documents before the deadline,” confirmed SAFA spokesman Dominic Chimhavi on Saturday. But he said SAFA had also asked Caf to provide more clarity on the hosting requirements as the replacement hosts have only six months to prepare. “We want to know what Caf’s requirements are from us if we are to be the host nation and indeed what they will be bring to the party. “Also what are their commercial partners contributing? There is little time to now be able to talk to other potential sponsors,” he told the BBC. It will be the first 24-team tournament and could become something of a crisis for Caf who were rocked by this week’s announcement that Morocco would not bid. Now Caf will have to choose between two countries with long established infrastructure. South Africa hosted the tournament in 1996 when it was first expanded to 16 teams from 12 previously and again in 2013 as replacements for Libya. The country’s 2010 World Cup infrastructure is all still in place and being used for football regularly, except for Johannesburg’s Elis Park which has gone back to being an exclusively rugby venue. South Africa’s concern, according to other SAFA officials speaking off the record, would be the cost of the tournament. The cash-strapped SAFA could not afford to host the event without getting financing from state coffers. Caf will make a decision on the 2019 hosts at its executive committee meeting in Dakar on 9 January.